Cover your Spaghetti and other favourite pastas with my family’s best healthy vegan fat-free marinara sauce. Lentils and chickpeas make it thick, and full of iron, fibre and phytonutrients. Add some spinach (fresh or frozen) to get a darker color, and more nutrition. Oregano, basil, garlic and onion, are a beautiful Italian combination that has lasted centuries. Modernize your greasy sauces of the past with this oil-free, meatless version of a marinara sauce, and fill your belly with fibre and taste at the same time. This is a great whole-foods plant-based wfpb recipe for kids! With lentils and chickpeas this no-oil vegan Italian tomato based spaghetti sauce recipe replaces a traditional meat based pasta sauce, with bold flavour! I've tested it on many non-vegans and they don't even realize, except wonder why it is so fat-free and lean. Use this simple recipe as a dependable base and add additional items if you like, such as mushrooms or green peppers. Put a large pot of pasta water on to boil. No salt or oil are necessary. No oil cooking, go! Read more here about why we cook with no-oil. Drain canned lentils and chickpeas. Consider reserving the juice (called aqua faba) in the fridge as an egg replacement for future baking - like for my VeganEnvy.com amazing chocolate birthday cake recipe. In a food processor - add drained chickpeas, drained lentils, garlic cloves, canned diced tomatoes (with juice), oregano, basil, onion powder, salt, onion chunks, and thawed spinach nuggets. Blend on high until beans are no longer recognizable. I like to use frozen spinach nuggets, so I can easily portion out a little if I want - I always have some on hand in my freezer, like these ones. I got them a Wal-mart. Empty sauce into a medium sized pot on medium heat. This sauce will splatter once it starts to bubble, so be prepared to cover it to protect your stove and yourself. Once the sauce is bubbling, reduce heat to low, stir, cover and let simmer for 5 more minutes so that the onion is cooked through. In the meantime, add whole grain spaghetti to the boiling pasta water. Set timer to cook according to directions, usually about 10 minutes. Once the the 5 min on the sauce is up, while the pasta is cooking, stir the tomato paste into the sauce. The tomato paste makes the sauce thicker, so there is no excess liquid. It also adds a lovely rich red color and taste. Simmer a few more minutes or until pasta is ready. Drain pasta and serve piled with generous portions of this delicious sauce! Sprinkle with vegan parmesan cheese. Vegetable side suggestions: steamed frozen peas and corn, broccoli, or Brussels sprouts. Salad suggestion: spinach salad and balsamic dressing. For example, if you would like to have a milk-free sauce for your pasta, or maybe you are trying to lose weight and avoid fat – here is a vegan, creamy fat-free white sauce recipe to add to your bag of tricks. It has pesto ingredients like basil, garlic, and lemon, but is no-oil, with healthy walnuts instead. Did you know walnuts slowed the growth of cancer tumours in studies? White kidney beans make it thick, you don’t need any flour – so it is gluten-free. Forget about taking time stirring on the stove, this sauce is easier than that, blend the ingredients, and DONE. This vegan white sauce recipe is better than alfredo sauce, I think you will find it very delicious and satisfying. If you are in Canada – I recommend these products for your lemon and pepper, from Epicure. Click image to view information. Bring together the wonderful flavours of basil and garlic in a creamy pesto sauce, with fresh linguine, and crispy asparagus, for a healthy taste of Italy! This sauce has a pesto flavour and is simply delicious with basil, garlic, lemon and healthy walnuts instead of processed oil. It is so easy to make, and clean up, this vegan white pasta sauce takes only 5 minutes in a blender. Linguine has more surface area than spaghetti, and will hold more sauce, so works very well and asparagus complements the lemon and pesto ingredients. steamer Available in Canada only. There are many sizes, made from a durable silicone, these steamers are awesome. Boil water and cook pasta according to package instructions. Wash, cut off ends, and cut asparagus into 2 inch lengths. Microwave asparagus in a microwave steamer. If you are in Canada, I recommend the Epicure steamers. See link in ingredients. In a high speed blender, blend white kidney beans with soy milk, basil, garlic cloves, oregano, salt, walnuts, nutritional yeast, lemon juice. Add hot pasta cooking water to warm and thin to desired consistency. Drain pasta, plate with asparagus, and immediately spoon creamy pesto sauce over steaming pasta. Or, if the pasta has cooled, microwave the sauce first in a small dish, to warm it, then spoon over and serve. Serving Suggestions: fresh ground pepper and additional lemon juice. 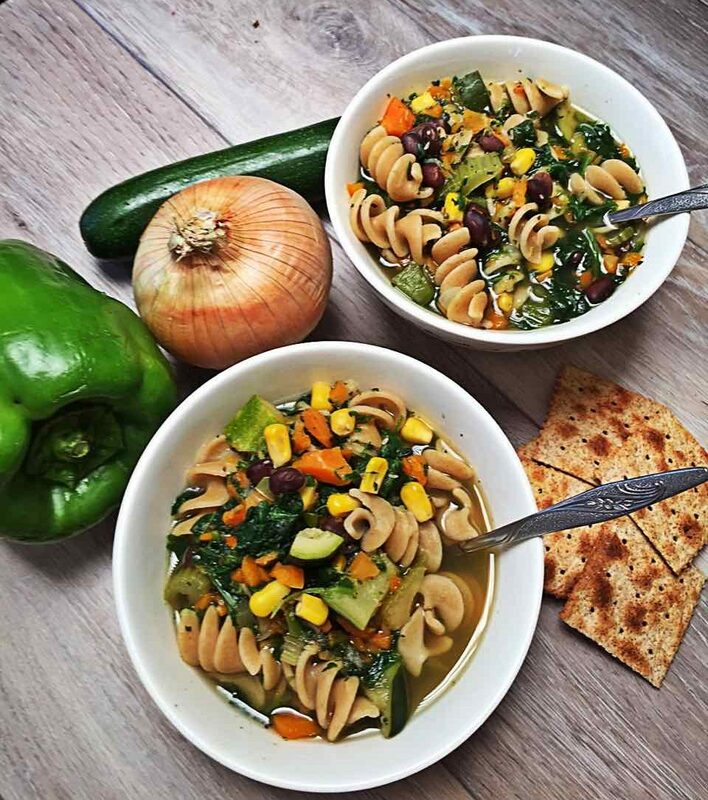 Green pepper, zucchini, spinach, black beans and corn are some of the key ingredients in this vegan dinner soup recipe. Plus basil, and oregano and a base of celery, carrots and onions. Together with a whole grain pasta, this is a satisfying vegan supper, and a great easy vegan dinner idea. The sweet vegetables balance out the stronger tasting ones very nicely. It is called Dad’s soup because my husband invented it. We have a few variations of a vegetable medly soup, this one is the green one. It is delicious, and as soon as we say “we are having Dad’s soup!” our kids go “yay!”. it’s got a lot of green vegetables in it. So to get our kids to eat this vegan meal we started by telling them we would eat it while watching a movie. If they ate their soup, the movie kept playing, if they didn’t eat it we would pause the movie and wait for them to eat. That worked, and they realized they really like this soup, now it is a meal we can count on them eating. first chop an onion, and carrots, with garlic, in a food processor, or by hand. Slice celery and add those ingredients to the pot. Chop zucchini next. Larger cubes work best. Add the seasonings, and continue adding the vegetables from my recipe, saute together. Substitute whatever green vegetables you have in your fridge, they will taste good too. Add the black beans, and corn. Hold off on the spinach, so that it doesn’t get over cooked and turn the soup too green. once the vegetable broth is boiling add the pasta and spinach and cook for 3 mintues more and you are done. 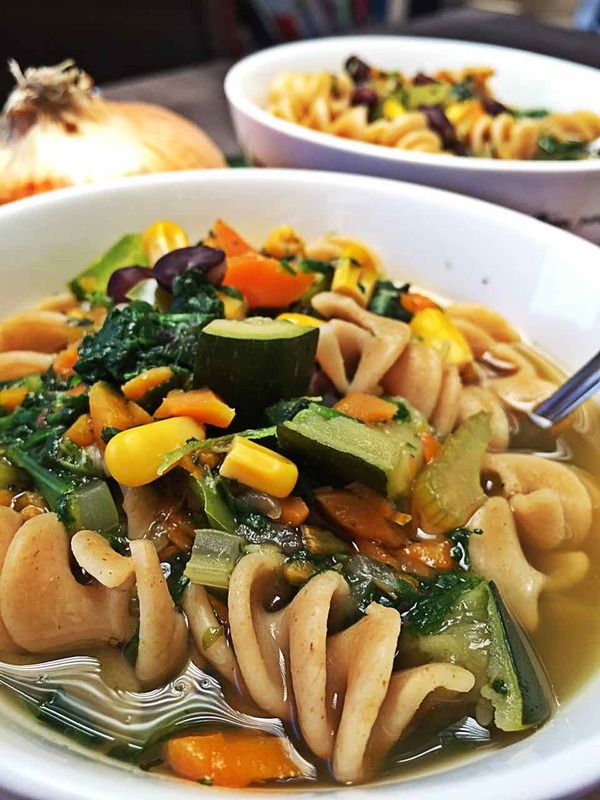 It takes about 35 minutes from start to finish to serve this rainbow of veggie dinner soup. Sauteing before adding the broth makes sure the vegetables are cooked through. and let me know in the comments below what you think. We recommend whole wheat crackers crumbled in it and some freshly ground pepper and salt to taste. If you have never made soup, this one is a no-fail way to start. With beans, and pasta, and spinach, and green vegetables, it is always gorgeous - and a hit with the kids. Herbed Sea Salt Grinder Grind over soup at the table, to taste. If you are in a hurry, then the food processor is going to be your best friend for this soup recipe. Process onions, carrots and minced garlic in your food processor. Slice some celery and add these all to a large soup pot on medium heat. Add salt, basil and oregano and cook for 5-7 minutes until the onion is translucent. Add broth and water a splash at a time if they start to stick. Chop or process and add zucchini, green pepper to the pot. Cook for 5-7 more min. In the meantime, start another medium pot with water for pasta. When the water boils add the pasta to it and set the timer according to the pasta package directions for al dente - probably for 9 minutes. Give a piece a cool down and a little chew test before draining. Add the rest of the broth and water and the can of corn with it's juices to the soup pot. Turn to high until it boils, then reduce to medium low. When pasta is done, drain and add the pasta to the large soup pot. Stir spinach into the soup and cook for 3 minutes until warmed through. Serve immediately, hot, with whole grain crackers and ice cubes on the side (to cool and so people can get more liquid if they want!). This healthy tofu Pad Thai is a low-fat recipe ready in 20 minutes. Use your own Pad Thai seasonings/sauce, or visit this Epicure website to buy the delicious Pad Thai mix that I used, and bookmark this recipe for later. I also show you how to make an easy tasty homemade Sriracha sauce from an Epicure spices mix. This recipe shows you how to make an oil free vegan Pad Thai with Tofu and Noodles. All VeganEnvy recipes are whole foods plant based, oil free, fat-free and exceptionally healthy! I follow the Forks Over Knives recommendations for disease prevention through diet. My kids asked if a couple of their friends could stay for dinner. That is pretty normal at our house. I agree, Pad Thai is good! A mild, slightly sweet comforting noodle dish with garlic and citrus flavours. especially kids from non-vegan families. They all seem to love tofu, and whole grain carbs, and most like plain vegetables too. Kids are very open-minded to eating simple vegan food, they see my kids, my husband and I like it, and they join in – especially when their parents aren’t around. I always test my recipes on children. If they like it, I know I have a winner. I grabbed a package of vegan Pad Thai spice mix from Epicure, because it is a fast, healthy, high quality way to pull a tofu dish together. It is spices only – no preservatives, fish, oils or additives. I have used Canadian Epicure products for over 15 years – they are fantastic and I am an Epicure consultant. Epicure is a great company for vegans. Unfortunately their products are only available in Canada. This should take about 20 minutes to pull together. I got started washing and chopping my vegetables, I really take pleasure in cutting them in ways that make them look appealing. Matchstick carrots, small broccoli, evenly cut green peppers. Makes them cook uniformly as well. I learned cutting techniques in the Forks Over Knives Cooking Course. While the vegetables were stir frying, I mixed up the Pad Thai spices with water and soy sauce. tamarind, garlic and cilantro for true Southeast Asian flavours. I decided to use a package of Medium Tofu and a package of Extra Firm Tofu. The Medium will crumble like eggs (eggs are common in pad Thai) and the extra firm tofu will be solid like chicken or shrimp. Once the vegetables were tender, but still with a bit of a crunch, they were done. I added the cubes of tofu and stirred them in. Then I added the sauce. I was very careful not to put the noodles in the boiling water until just before the vegetables were done, because the noodles truly only take 5 minutes to cook. I rinsed the brown rice noodles with cold water to remove extra starch, and added them to the wok. I also decided to make homemade Sriracha sauce using an Epicure mix, ketchup, and vinegar. Sriracha sauce really enhances the Pad Thai for adults. Squeeze some lime on each plate (or lemon) and serve. It was really, good, the kids gobbled it up. I forgot to do this for my photos, but add some chopped peanuts to your Pad Thai! It makes a huge flavour and texture impact. Until I write that recipe, if you are in Canada, please feel free to buy this healthy, oil free, vegan Pad Thai mix from my Epicure website. The Epicure company is on Vancouver Island, British Columbia, Canada and cannot sell to other countries yet. This recipe uses a vegan Epicure Pad Thai seasoning mixture, to make a vegan pad thai, with tofu, broccoli, green pepper, carrots, and whole grain rice noodles and without oil. 1 package Epicure Pad Thai Seasoning Pack or store bought pad thai sauce, sorry I haven't invented my own seasonings yet! Suggest how in the comments! Stir the pad thai seasoning mix with 3/4 cup (180 mL) hot water and 2 Tbsp (30 mL) soy sauce. On medium heat, stir fry green peppers and carrots for 3 - 4 minutes. Add 1/4 cup or less of water if they start to stick. Cover to speed cooking time. Add broccoli and cover, cook for 7 more minutes, stir frequently, until tender, but still bright green and slightly crunchy. Add medium cubed tofu and stir in so that it crumbles like scrambled eggs. Add extra firm cubed tofu and gently combine so that it stays in cubes. In a large pot boil water for noodles. Once the vegetables are almost done, add 12 ramen cakes to boiling water per cake Try for 2 cups of water per cake. When noodles begin to unfold, after about 1 minute, separate gently with a fork and reduce heat to a low boil. Continue to cook for 3 minutes or until the noodles are just soft. Strain through a colander, and rinse with cold water. Add cooked rice noodles to the vegetables with the prepared sauce, tossing to heat through. Serve immediately, with freshly squeezed lime juice, sriracha sauce, and chopped peanuts. This wfpb no-oil vegan lasagna is based on traditional Italian lasagna, but with a vegan cottage cheese / vegan ricotta substitute, made from tofu, basil, and lemon juice. Fast vegan lasagna recipe that only needs 20 minutes to cook in the oven. Need a vegan dinner recipe that is great for non-vegans too? I have served this lasagna many times to non-vegan friends, to rave reviews. Vegetarian lasagna is a dish people are familiar with. This is the best cheese-free, meatless, vegetarian lasagna recipe I’ve made. I make lasagna all the time, it’s one of our family standard meals, when I have 90 minutes. I’ve tried many, many vegan variations, this one is our favourite. The reason is because of extra noodles, and the zucchini gives it more bulk. It’s not runny, but has a perfect sauce consistency. Using blended diced tomatoes and tomato paste makes a nice dark red, thick, tasty, and healthy, sauce. Tomato paste is LOADED with antioxidants (fight aging, prevent cancer, reduce inflammation, promote healing). There was even a study that showed people’s sunburns healed faster when they ate tomato paste daily. See Preventing Skin Cancer from the Inside Out video. you can cook this healthy lasagna really fast – it is easy to make, think about how you can relax while it cooks in the oven. If you don’t have a food processor, and you have mad knife skills, please try it anyways, and let me know in the comments how you made out? Watching my kids pick noodles out of lasagna (to eat first) inspired me to use double layers of pasta in this recipe, so that there is more pasta for a satisfying meal and to get a great consistency. I have added the zucchini to balance out that extra starch, so you are also getting more vegetables. I am sure this recipe will be popular with kids and your non-vegan friends too. Plan to have 20 minutes to bake the vegan lasagna in the oven and about 70 minutes to cook your whole grain noodles and assemble the layers. You can get this lasagna done in 1 1/2 hours – about 90 minutes. Sprinkle the lasagna generously with almond flour and then salt and garlic powder – looks just like parmesan! This vegan lasagna calls for spinach, lemon, and garlic in the tofu ricotta layer. Zucchini and tomato paste give the tomato sauce more substance, it is thick, and italian seasoning adds great flavour. Most italian recipes call for oil, and most people have heard and read that olive oil is healthy. In this NutritionFacts.org video, Dr. Greger looks at the research on how olive oil affects artery function. Check it out. All oils, including olive oil and coconut oil, have been shown to cause a constant and significant decrease in artery function after meals. Inflammation increases, and blood vessel flow decreases in your body when you eat any fat, including olive and coconut oils. Oils hurt our arteries and increase inflammation in our body. Inflammation leads to disease. since olive oil is often consumed with vegetables – in a salad for example – there can be a positive effect when eating oil, because of the vegetables – despite the oil. and just eat the vegetables – and you will have much improved arterial function. These physicians also recommend you eat an ounce daily of whole nuts and seeds to get the oils/fats you need – delivered in a food, not from a factory – the way nature intended! Because this lasagna has no oil, no meat and no cheese, there is no grease, no oils when you are done. The empty pan here is after I simply rinsed it with water – no soap required. Squeaky clean. Think how clean this makes the inside of our bodies as well – no clogged arteries, no blocked blood flow to our brains or other important body parts (um, men). Enjoy this lasagna with your family, it is a great meal to add to your regular routine, and because it has no added oil, it is a good way to keep your arteries clean and functioning well, preventing heart disease in your children and yourself. This is a great healthy vegan, delicious, vegetable lasagna with no oil. Make in a 9 x 13" open casserole dish (no lid or foil required). It uses tofu and spinach as a quick and easy ricotta cheese substitute. It tastes like a traditional Italian lasagna, except it is low fat, high fibre and not full of cholesterol. The zucchini makes it so colourful, and so good for you! Even if you have never made lasagna, you can succeed with this simple basic lasagna 101 recipe. 4 tbsp almond flour or 2 tbsp nutritional yeast, for sprinkling on top. We prefer almond flour, it looks like parmesan. Preheat oven to 350° F (175° C) on convection bake. You will need a 9 x 13" uncovered casserole dish. In a large pot, start water boiling. No need for salt or oil. In a food processor, add the diced tomatoes, tomato paste, onion, zucchini chunks, Italian seasoning and nutritional yeast. Process until in small pieces, but not fully blended. Add salt, to taste, if your Italian seasoning is salt free. Pour the tomato sauce into a medium saucepan on the stove, bring to a simmer. Cover, and cook until the tofu ricotta mixture is ready. Thaw the frozen spinach in the microwave for a few minutes. You can leave it in the package, put it on a plate to catch any drips. This is a good time to add the 18 whole grain lasagna noodles to the boiling water. Sometimes I add a couple extra noodles in case any get ripped. In the food processor, add the extra firm tofu, garlic, thawed spinach, lemon juice, sugar, salt, and basil. Blend until lumps are gone. Spread 1 cup tomato sauce on the bottom of the casserole dish. Place a second layer of 3 more noodles (double noodle layer). Kids love this. Spread all the Tofu ricotta over the double noodle layer. Top with the remaining 1.5 cups sauce and spread evenly. Spread 4-5 tablespoons of almond flour generously over top, (it looks like parmesan), then sprinkle with garlic powder and salt. Also you could use my Vegan Parmesan Cheese over top, or nutritional yeast. This bok choy, tofu and noodles soup is so tasty, it is easy, simple and fast to make and is satisfying for dinner, and something you can definitely serve to non vegan company with confidence. Bok Choy goes so great with tofu, and soy sauce, and ginger. A medium tofu (softer than firm) works best in the soup because it has a complementary soft texture to the stiffer bok choy and carrots. See my article All About Tofu for tofu tips. The texture combinations when you enjoy a spoonful of this, are truly excellent. For this tofu soup recipe I used “Shanghai Bok Choy” it is larger than baby bok choy, but not full size. Full size and baby bok choy will work as well. Cut bite size pieces – whatever kind of bok choy you use. Bok choy is a nice mild addition to many dishes, and it is very healthy for you. Bok Choy is a great source of calcium – did you know? One cup of bok choy contains the same amount of calcium as a glass of cow’s milk, due to having a better calcium absorption rate (in the 50–60% range, where calcium from milk is 30-40%). See this article for more about calcium absorption. The best sources of calcium come from the earth, in foods such as kale, broccoli, bok choy, and Brussels sprouts. As a bonus, these vegetables are high in vitamin K, which is also important for strong bones. Not that you have to worry, there is no need to specifically target calcium sources in your diet; a diverse, whole-foods, plant-based diet will provide all of the calcium you need. In one study, fruit and vegetable intake was positively associated with bone density. My bok choy was very clean, not much dirt trapped under the stalks. I chopped it like this, then put it in a large colander and gave it a rinse in the sink before adding it to the bubbling broth. If you don’t have spaghettini you can use whole grain spaghetti, it will take a few more minutes to cook, but thicker noodles are fun too, right? I used canned mushrooms because I wanted to use staple ingredients that most people have in the kitchen. If you use fresh or dried mushrooms it will make this soup even more delicious for you. Add cubed medium tofu near the end, and gently stir through the soup. Chop your dried seaweed (optional) before you add it. Seaweed contains iodine – an essential nutrient for health. Sprinkle some chili peppers in your bowl, or leave it mild and add a bit more soy sauce instead. Spaghettini noodles are thinner than spaghetti, and cook in 6-8 minutes, so this soup is fast to make, plus, the noodles make it familiar and appealing to kids. The tofu adds substance and you can be sure it will fill you up as a main dish. On high, in a large soup pot, combine the vegetable broth with 6 cups water, mushrooms, seaweed, and ginger and bring to a rapid boil. Wash and chop the bok choy and carrots. Once the broth is bubbling, reduce heat, break the spaghettini noodles into very small pieces and drop them in. Cook until the noodles are al dente, about 3 to 4 minutes. Increase heat back to high, add the bok choy and carrots. Reduce heat to medium once the soup begins simmering again. Slice and add the bell pepper and onions, increase heat as required, to keep the soup bubbling gently. Cut tofu into large cubes and add with cilantro. Cook for 2 to 3 minutes longer. Stir in soy sauce and serve at once. Season with crushed red pepper, or hot sauce, and additional soy sauce. To use frozen ginger, leave the skin on and grate it on a microplane grater. Try dried mushrooms for even better flavour. For a more traditional asian soup, use whole grain buckwheat soba noodles instead of whole grain spaghettini. Chinese cabbage also works well in this soup instead of bok choy. This recipe is a Creamy Tofu Pasta Sauce, with Garlic, Zucchini, Spinach & Tomato. It is a fast, easy vegan dairy-free cream sauce that is high protein, healthy, and low fat because, like all my recipes, it is delicious without oil. This fast tofu pasta sauce dinner only takes 30 minutes to make. Use soft silken tofu to make a creamy, tomato and zucchini pasta sauce for dinner that is oil free and nut free. If you like garlic, tomatoes and creamy sauces you will like this simple pasta dish. It is an easy and quick vegan recipe for beginners and experienced cooks alike. This tofu pasta sauce has a flavour that is fantastic, and works with vegetables other than zucchini too. Add spinach in the last step for a true vegan experience. Don’t forget the lemon! Is Traditional White Cream Sauce Fattening? Did you know? Making a tofu pasta cream sauce from 600 g silken tofu instead of the equal 2 1/2 cups dairy Half & Half cream (considered low-fat cream) reduces calories from 787.5 to 270 calories. Using soft tofu in your pasta sauce instead of half and half cream reduces fat from 69.5 grams to 15 grams. And, if you made a white sauce with flour, skim milk and 4 Tbsp of butter you are getting even more fat – 2.5 cups of that sauce would be 905 calories and 65 g of fat. So, stick with us healthy vegans here, and choose to keep your blood flowing to your brain without blockages. Choose 15 grams of fat in this low fat, healthy tofu pasta sauce recipe without oil, vs. 65 grams of fat with traditional pasta sauces. So, YES, dairy white sauce is fattening. Plus, tofu is cholesterol free, dairy is full of cholesterol. You can make this fast dinner recipe in the time it takes you to boil the pasta. Pre-chop your vegetables and add them to a large pot. Add the tomato paste and stir. Blend the silken tofu and once creamy, add it to the vegetables. New to using tofu? Read all about silken tofu in my All About Tofu post. Stir the tofu pasta cream sauce until completely combined. Add spinach and stir to melt it into the pasta just before serving. You don’t need to cook the spinach longer than a few minutes. While this vegan tofu pasta sauce recipe has no oil and is low-fat it will fill you up quite quickly. It has a good amount of protein, and is full of nutrition that you need to be healthy. Make this vegan creamy low fat and healthy tofu pasta sauce dish with silken tofu for a completely satisfying, easy, fast and delicious high protein dinner. Optionally, stir in fresh spinach, just so it wilts and melts, then serve with generous squeezes of refreshing lemon juice. It only takes 30 minutes to make and is flavourful! No oil, but creamy. Dairy free of course. Assemble your ingredients, open cans so you can add ingredients easily, this dish comes together very quickly. Put on a medium pot of water to a boil for the pasta. Cook the pasta according to package directions while you make the veggies and sauce. Cube the zucchini. Mince the garlic cloves. Heat a large pot to medium heat, add the cubed zucchini, garlic, and salt, and stir. Moisture will come out of the zucchini - it shouldn't burn. If it gets dry add water a tablespoon at a time to moisten. Slice the red pepper, and dice the jalapeño, if using. Remove the seeds if you don’t like things too spicy! Once the zucchini has slightly softened, add the peppers. Stir for 2 minutes. Add the tomato paste and stir to coat the vegetables. Your pasta should be almost done. Stir in the undrained diced tomatoes. Blend the silken (soft) tofu in a small blender until it looks like sour cream, and stir into the vegetables. Drain the pasta and add the hot pasta to the vegetables and sauce. Taste for salt, add more if required. Once bubbling, turn off heat, stir in spinach leaves just so they wilt, and serve. Squeeze liberal amounts of fresh lemon juice on each serving. While the pasta is getting comfortable with it's new saucy partner, gather up any toppings you want to use. Like vegan parmesan cheese for sprinkling, additional diced jalapeño, and toasted pine nuts. Enjoy your creamy, vegan, saucy vegetables and pasta!